Anna Symonenko, the Head of Recruitment at Daxx, has experience in both international and local “headhunting”. Throughout her career in IT recruitment, Anna has had the opportunity to work at one of the top 5 biggest outstaffing companies in Ukraine as well as at a recruitment agency that specializes in hiring and relocating software developers from all over the world. In this interview, Anna describes current trends in the Ukrainian IT market, how to attract and hire best developers in Ukraine, answers FAQs from Daxx clients, and shares her experience-driven advice on recruitment in Ukraine. Q: Can you please describe the Ukrainian tech talent market to us? Anna: Ukrainian developers have already earned a reputation for high level technical expertise and solution-driven attitudes towards any technical problems that may arise during projects. They tend to be proactive, meaning they not only follow the customer's guidelines while solving issues, but also think out of the box and suggest their own solutions. The leading tech universities in the country are located in Kyiv, Kharkiv, Dnipro, Lviv, which is one of the factors that has helped these cities become the main tech hubs in Ukraine. Ukrainian tech education mostly concentrates on the theoretical knowledge, which helps the prospective software engineers develop structured analytical thinking. No wonder CS graduates can master several programming languages on their own. This type of education is much more efficient and valuable than simple cramming of the programming language syntax, which is similar to teaching reconditioning a vehicle with no knowledge about the mode of mechanism. Thus, Ukrainian software developers learn the essentials of programming at the universities and proceed with coding at a rather young age on their own. Students of CS faculties start to work as trainees in IT companies, find freelance jobs, or create their own pet projects, often working part time. As a result, when they graduate at 22, they already have few years of hands-on experience and their level is way higher than that of their European peers. Q: Is it hard to recruit developers in Ukraine specializing in rare technologies or specific business domains? Anna: As more and more tech start-ups open their development centers in Ukraine, the technical expertise of our engineers extends to the most trendy business domains. You can recruit developers in Ukraine specializing in almost all technology domains including the most popular ones like fintech, IoT, SaaS, blockchain. At Daxx, we have web projects in Scala, Golang, Python, C++ and mobile in React Native, Ionic, Swift and Kotlin, so we can indeed boast a varied technical skillset of our developers. Students of CS faculties start to work as trainees in IT companies and when they graduate at 22, they already have few years of experience. Q: What is the business environment like in Ukraine? Anna: The number of outsourcing and outstaffing companies in Ukraine continues growing each year, as the expertise coming from the local IT ecosystem attracts business owners from all over the world. Western entrepreneurs also value Ukrainian tech market for cultural similarity, business ethics, reasonable prices, and comfortable for remote cooperation timezone. 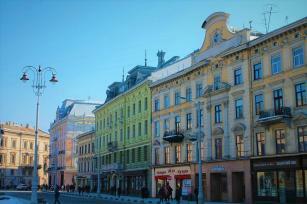 Some of the international companies with global names opt for recruitment in Ukraine and open development centers here. Also, more and more tech start-ups are launched in Ukraine and we expect further growth of product companies in the coming years. Taking into account all of the above factors, no wonder software developers in Ukraine are in such great demand. This tendency has only one drawback—as companies constantly compete to recruit the best developers in Ukraine, the candidates’ salary expectations get larger. While the junior developer salary starts at $1,5k, rare stack and higher level of seniority can rise developer’s salary up to $5-6k per month, which is a reasonable price for high-level tech expertise. Q: What is the developer interview process like at Daxx? First, we identify and approach the pool of suitable candidates. This takes us around a week. Our aim is not only to find the candidates who match the requirements, but also to offer them our available vacancy in the most attractive way to get them interested. That's why we always ask our clients for as much information about the company, project, team, tech stack, development process as possible. Next, we conduct an HR interview to go over the candidate's background, check his/her soft skills and English proficiency level, share more information about the project. Once we find an appropriate candidate, we present the candidate's profile for the client's consideration. From that moment, the ball is in the client's court and if the profile matches their expectations, we schedule the first round of client interviews. We are flexible enough to implement the recruitment process customers usually have onsite. Normally, there are up to 2 rounds of client interviews. Our advice is that the selection process with one candidate shouldn’t take longer than 1-1.5 weeks. Our standard recruitment timeframe is 4-6 weeks from the moment we open the position till the moment the developer joins the team. Of course, it always depends on the tech stack, specific business domain knowledge, and experience required for the position. The more complex the requirements, the more time it will take to find and hire the developer. Also, it is important to keep in mind the notice period for your potential employee which in most cases is 2-4 weeks. The junior developer salary starts at $1,5k, rare stack and higher level of seniority can rise developer’s salary up to $5-6k per month. Q: What are your top tips to successful recruitment in Ukraine? As I mentioned previously, when recruiting in Ukraine, it is important to keep up to speed with our competitive IT market. We always ask our clients to provide feedback after each round of interviews within 1-2 business days, so that we are able to keep up with our timelines and make sure we don't lose the candidate to another company. Be precise in what you need and what your expectations from the developers are. Let the recruitment team know any time there are any changes on your side. This will help us provide you with the most relevant profiles within the shortest time period. Be prepared to onboard the new team members and manage them remotely. If you don't have such expertise, Daxx has its own proposal that discloses terms of cooperation with a remote team and the process set up. Make sure you offer challenging development tasks and provide the opportunity to use top notch tech stack on your project. This will guarantee you a wider pool of candidates willing to join your team. Q: What are the frequently asked questions about Daxx model that you receive from our clients? 1. What’s the difference between the Daxx model and other outsourcing models? This is one of the main questions that we answer and that the clients should answer to themselves before choosing an outsourcing vendor. If you need a dedicated team that works exclusively on your product on a long-term basis—outstaffing is your option and Daxx can help you. If you are interested in a project-based cooperation and you need immediate availability of the development team with some unique technical expertise, outsourcing the project would be a better solution. 2. Where will my development team be located? 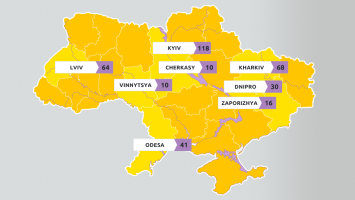 Daxx has three development centers in Ukraine: Kyiv, Kharkiv, Dnipro. Depending on your personal preferences and the number of technical experts of certain tech stacks available, you can choose whether to recruit developers in Kyiv, Kharkiv, or Dnipro. Team retention, as well as replacement and extension of your in-house team. Office space, computers, servers, secure networks, telephones, conference rooms, kitchens, lounge zones. Daily support and consulting for you and your programmers with the help of our HR managers, recruiters, system admins, office managers, and in-house consultants. 3. What happens if a developer leaves? If we are not satisfied with the performance of a developer? You have a 1-month trial period during which the termination period is 1 day for both parties. After that, if something goes wrong, you have a 30-day notice. Daxx will find a replacement for your team in the meantime. 4. Do you have immediately available developers? Can you take a developer from one project and switch to another in case of an urgent need? Daxx hires each developer exclusively for a particular project. All of our employees are dedicated to their client’s product development only, meaning they don’t work on any other projects at the same time. We don’t have anyone on the bench, so, we usually don’t have someone available immediately. But if there is a developer whose project ends/the team is being cut by the customer/the developer is willing to leave the current team (in this case, we inform our customers beforehand and start the process of replacement and knowledge transfer), we will definitely offer this employee other possible roles within Daxx. Make sure you offer challenging development tasks and provide the opportunity to use top notch tech stack on your project. Q: How does Daxx recruit developers in Ukraine? Anna: Our team of recruiters consists of 15 professionals. Daxx Recruiters and Client Managers are there to find the best candidates, interview them, guide them through all steps of recruitment process, and onboard successful candidates. In case we need to extend our recruitment capacity on a short notice, we use a network of reliable recruitment partners. Besides that, internal and external recommendations have proved to be one of the most efficient recruitment sources. Daxx is a frequent co-organizer and sponsor of a number of technical meetups and conferences, which gives us the opportunity of networking with the people who might not be considering any job opportunities at the moment, but will most likely be more prone to respond to Daxx recruiters next time we reach out to them. If you need a dedicated team that works exclusively on your product on a long-term basis—outstaffing is your option. Q: How do Ukrainian developers choose the company (employer?) What entices them the most? The value of the product you develop and the tech stack. Your company's name, its reputation, financial stability, and salary offered. Room for promotion and professional development. Clear and well-organized development process and communication. Q: Can you describe the mentality and qualities of Ukrainian developers? Anna: Our clients are often amazed by the high level of tech skills of Ukrainian developers. 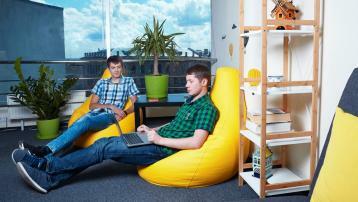 Besides tech skills, Ukrainians are known for their diligence, hard-working nature, and creativity. Ukrainian developers are motivated to promote their knowledge and skills, thus, the majority of senior level developers are as young as 27-29 years old. 82% of Ukrainian developers say they work in software development because they are passionate about the technology, at the same time, 48% code for fun in their free time. In combination, these qualities often bring major benefits to companies cooperating with Ukrainian developers. Be precise in what you need and what your expectations from the developers are. Q: Why do business owners choose Daxx? Anna: In our last satisfaction survey, we asked our customers to evaluate different aspects of cooperation with Daxx, such as: recruitment, HR/Account management, team performance, impressions from cooperation with Daxx, etc. 94% of the surveyed clients indicated high satisfaction with the quality of the recruited candidates, 89% were satisfied with HR/Account management, and 84% were happy with the performance of their teams. Apart from the data above, we found that 61% of the surveyed clients would definitely recommend Daxx to a colleague or a friend, while the rest told they would be quite likely to do the same. I believe, these high indexes answer your question pretty well. Fill in the form below to find out more about cooperation with Daxx.